Whether you are organising a large corporate event or an intimate upmarket birthday party and you want to BOOK A COMPERE MAGICIAN, you will have peace of mind that Colin Underwood will deliver an outstanding magical experience. His compere skills have been honed from many years of experience in casinos, cruise ships and hotel bookings. The added bonus of booking a magician as a compere is that you will obtain an ideal package that will enhance and make your next function a complete hit. His magic is visual and engaging for all demographic audiences and is sensitive to religious beliefs and cultures. Whether you require a smart sophisticated presentation or a more informal relaxed presentation at a Corporate Golf day, Colin will provide. His vast amount of experience and skill sets translates to a successful and unique function for you. Any unexpected problems that might arise, are dealt with professionalism, leaving you with a secure knowledge that no matter what happens, the clients are captivated and entertained. Book Colin today! His acts are adaptable to fit into your brand and promote themes and new products. His personal brand is smart sophisticated with highly entertaining moments, thus making him the ideal choice for your next function. Booking a corporate magician allows corporate messages and themes to be conveyed in a visual and unique manner which will be long remembered after the event. DO YOU WANT LAUGHTER AND AMAZEMENT AT YOUR FUNCTION? The combination of modern magic routines that engage combined with Colin’s strong personality and sense of humour is a guaranteed success formula. The acts can play according to your requirements, either a low-key table to table interaction or a larger stage presentation and with the use of AV facilities and plenty of engaging audience participation routines, and allows you to make the use of Colin’s performances for those really bigger year end staff functions. Larger Illusions are an option for that Las Vegas feel which allows one to produce the MD magically from an illusion box. No major rehearsal is required and this idea certainly enhances the magic theme. To make the magic happen click here. Are you organising a carnival or other themed function and require visual entertainment or Circus type acts? Colin can provide you with one of his many engaging Carnival characters. 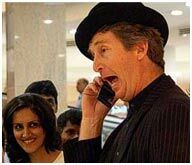 A crazy businessman, Crazy waiter or Mad scientist are just a few of his engaging character acts. Booking Colin offers you various options for your function. If you need more information then have a look at previous client referral comments, You Tube videos of performances or ask Colin to come in and have a meeting to discuss your needs and to show you a little magic to the Organising committee. Colin’s easy going professional approach to his work has resulted in a successful career spanning 37 years. Send Colin an inquiry with full details of your requirements and he will reply personally within hours. Join the ranks of many previous clients that have hired Colin on an on-going basis over his long international career. Thank you again for the lovely entertainment you provided for our function in Windhoek. All our guests are still commenting on the fun they had and trying to figure out how you did your magic. From the shrieks of laughter to the gasps of amazement, Colin was a huge hit, entertaining us with his unique brand of comedy and magic, with howls of laughter filling the room.